You’re Rehired! How to Simplify Your Rehiring Process with iSolved Reboarding. Rehiring previously terminated employees is a popular practice in many types of businesses (for example, a summer job at the pool rehiring college students each time they come back for break, or an ad agency letting go of workers when the account they were working for has ended). You’ve probably most recently heard talk of firing and rehiring, an option many federal contractors had to consider, in regard to the government shutdown. Rehiring happens, and for the sake of the employer and the employee, it’s best to make this process as simple as you can. iSolved’s new Reboarding feature (part of iSolved Onboarding) allows rehires to simply review the tedious paperwork and training they had to plow through when they initially onboarded, only making changes if needed. Setting up iSolved Reboarding for your employees is super easy. Go to Employee Maintenance > General. You should land on a screen that defaults to a list of your active employees. 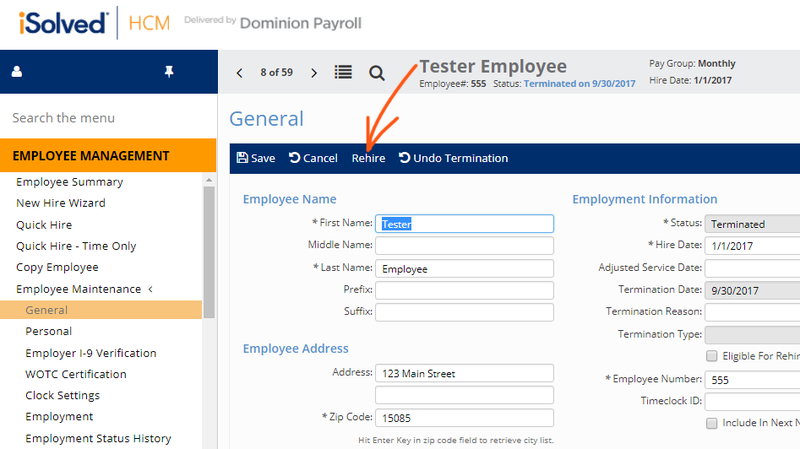 Choose the returning employee and hit “Rehire” in the blue bar on the top of the screen. 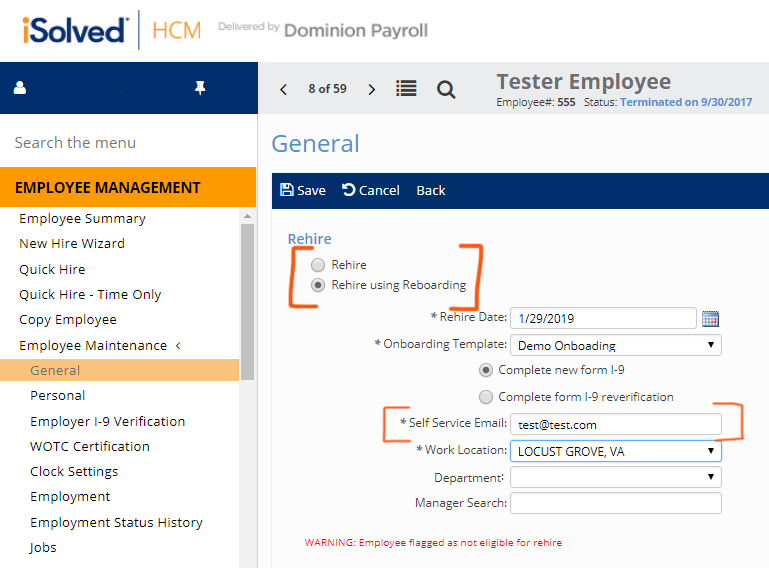 Once you’re on the rehire profile page of the employee you’d like to rehire, select the “Rehire using Reboarding” option in the top left corner. From here, fill out the rehire date and any applicable *required fields and save your changes. Be sure to use an email that your rehire is actively using in the self-service email field. After you save your changes, your rehire will be sent an email with a link and instructions to reboard. You’ll be notified via email when your employee completes the reboarding, and you will then need to go to Employee Maintenance> Pending Employee Dashboard > Rehire. 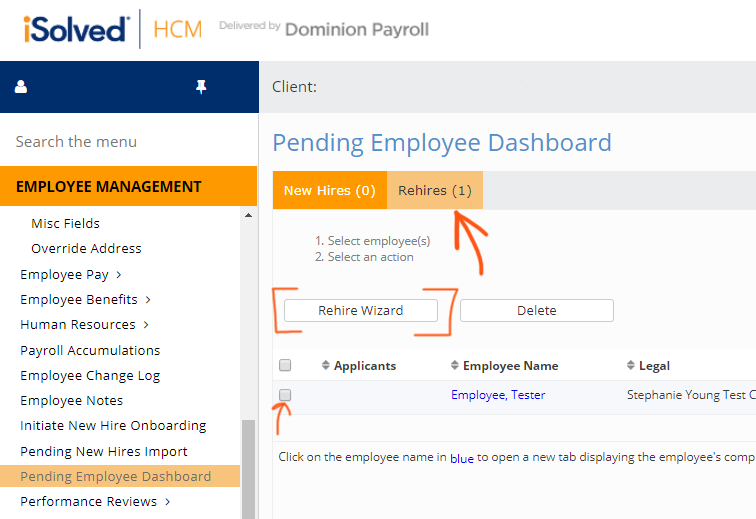 Select the employee and complete the Rehire Wizard – be sure to update rate of pay, manager, etc. as needed. Once that is completed, the employee will fall off the pending employee dashboard and be active in the system again, including them in payrolls going forward.